The luxury condos and bi level lofts at Metropolis offer stunning views of the Las Vegas Strip set as a background to the Wynn Golf Course. The Wynn Golf Course was in the planning process to turn it into Steve Wynn’s latest vision – Paradise Park. This was nixed last year. There will be some redevelopment of parts of the golf course, but no elaborate lagoon in the desert. The Me Too movement seems to have taken down one of the greatest visionaries that Las Vegas ever had. And as he resigned, so did this latest vision. The photo above was taken from our 8th floor Metropolis Loft listing. Pretty Amazing Views! From Metropolis Condos, you get a Trifecta of Views. 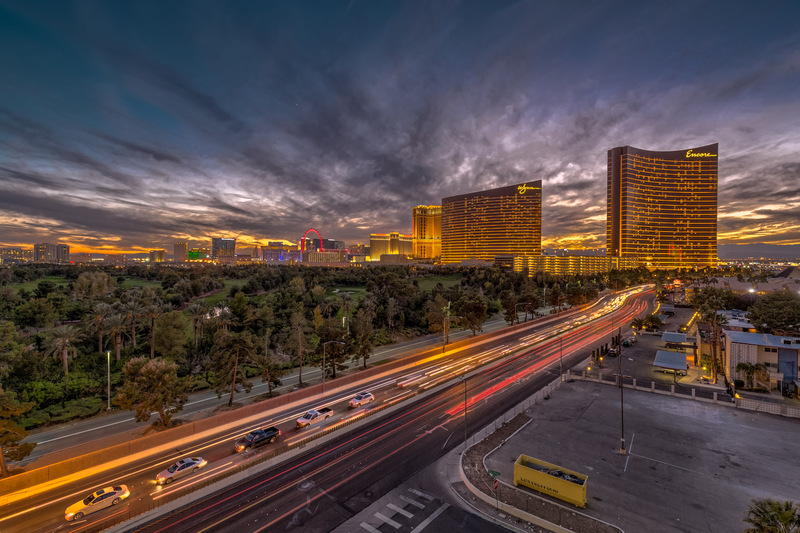 Glorious Sunsets, Golf Course Greens, and The Lights of the Strip and the High Roller Wheel. With the opening of Resorts World in a year or so, and the walkability from Metropolis to Genting’s latest Las Vegas Resort, the lofts and flats at Metropolis should be in high demand. Resorts World Las Vegas will be an Easy Ten Minute Walk from Metropolis. Contact The Stark Team to get started in your Metropolis Las Vegas Condo Search Today. We sold the Metropolis Loft Featured in the video below. It’ll give you an idea of the night views. The building may not have the WOW! factor that other Las Vegas High Rises as Veer Towers and The Martin do, but once inside, the condos and 2 story-lofts at Metropolis WOW! you with the amazing spaces and the glorious views, entry galleries, huge closets, livable lofts, and 2 parking spaces per unit typically. And Again – There Those Metropolis VIEWS!